Kate Middleton and Prince William have presented their newborn daughter to the world as they left St Mary’s Hospital in London. The princess is the couple’s second baby and the fourth in line to the British throne. 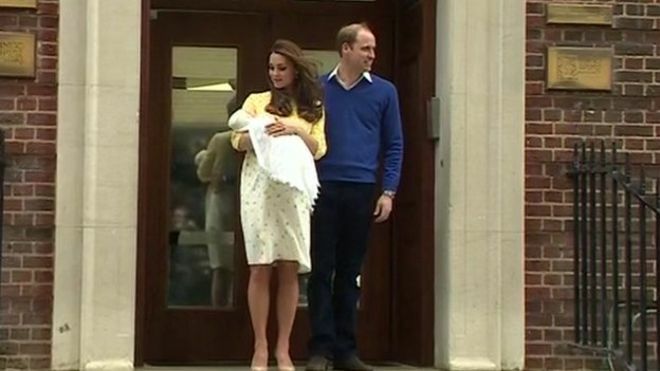 The baby girl was “safely delivered” at 08:34 BST, the Kensington Palace statement said. Kate Middleton, Prince William and their daughter have left the hospital on the same day the Duchess gave birth to the princess. The couple will travel home to Kensington Palace, where their firs born, Prince George, wait for his sister. In a statement, the Kensington Palace said: “Their Royal Highnesses would like to thank all staff at the hospital for the care and treatment they have all received.